In the Jardí Botànic, Barcelona's botanical garden with a total size of 14 hectares, you can see the typical vegetation of six different zones with Mediterranean climate and the Canary Islands. The beautiful park between the Castell de Montjüic and the Olympic stadium comprises typical forests and shrubs from southern Australia, South Africa, Chile, California, the Canary Island and the three Mediterranean zones. 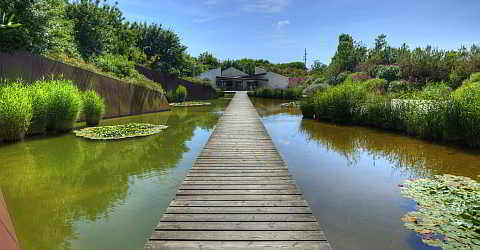 The botanical garden covers more than 14 hectares and is one of the largest parks in Barcelona. From here, you have a wonderful view of the Llobregat Delta, the urban area of Barcelona, the freight port and the Olympic sports venues on the Montjuïc. The botanical garden features a representative selection of the flora in regions with Mediterranean climate all around the world. The Mediterranean climate is characterized by dry, hot summers. The rain mainly falls in winter, which is why it is also called winter rain climate. This climate zone is not exclusively found in the Mediterranean area, but also in other regions roughly at the same latitude as the Mediterranean area. The vegetation in the areas with Mediterranean climate is mostly characterized by sclerophyllous plants like the olive tree, a typical Mediterranean plant. The aim of the park, which opened in 1999, is among other things the conservation of rare plant species. About 1 500 plant species grow in the Jardí Botànic. Since the park is still quite new, most of the plants are relatively young. Some areas have not yet been planted in order to maintain a mixture of old and young plants. Still, the park is very pretty and there is a lot to be discovered. The park was laid out by an interdisciplinary team led by the architect Carles Ferrater. In the Institute of Botany within the compound of the garden, there are changing exhibitions related to botany on display. The Mediterranean zone of Australia is the second largest one after the Mediterranean itself. It consists of two sectors in southern and southwestern Australia. In this climate zone, some 8,000 endemic plant species are known, 75 % of which are wide-spread, the remaining 25 % grow sporadically. The climate with monsoon rains is influenced by the tropics. In Chile, a narrow zone along the coast has Mediterranean climate. Since it is close to the Pacific Ocean, it is a little cooler and often there are foggy conditions near the coast. There are 2,400 endemic species here, 23 % of them are wide-spread. Characteristic plants along the coast are shrubs that are little fire-resistant as natural fires hardly ever occur in the Chilean Mediterranean zone. California's coastal sector with winter rain climate is 100 to 2000 m wide and extends from Cape Blanco in the USA to Punta Baja in Mexico. San Francisco is the zone's centre. There are 43,000 known endemic species, 25 % of which are wide-spread. The Californian climate is distinctively Mediterranean. Around 85 % of the rain falls in winter so that it is very dry in summer. Plants like the yucca palm are adapted to the dry periods in summer and can store water for a long period of time. The smallest zone with Mediterranean climate is South Africa with 8,500 known species. Since natural fires occur regularly, a large number of species (85 %) is wide-spread. It mainly rains in winter, but due to the monsoon, it is never entirely dry in summer either. The vegetation in South Africa mainly consists of shrubs and bushes. The land around the Mediterranean is referred to as the Mediterranean Basin. Altogether, there are more than 25,000 endemic species originating in Europe, Asia and Africa, 50 % of which are wide-spread. The plants, strong trees, shrubs and bushes, have developed remarkable regenerative abilities. They resist fire or regenerate quickly after fire, storm and extreme drought. There are offered some guides tours. You can learn many about the plants and their survival strategies. Information on the website of the garden.